Enter the base number (integers only) of the exponential expression. For example, in the expression 24, the number two would be the base. If you are entering a negative sign be sure to indicate the parenthesis preference on the next line. If you are entering a negative sign you will need to select whether or not the negative sign and base are in parenthesis. (-4)2 = 16 whereas -42 = -16 (additive inverse of 42). Enter the positive or negative integer of the exponential expression (maximum of 500). For example, in the expression 24, the number four would be the exponent. This is the entered base number raised to the entered exponent. 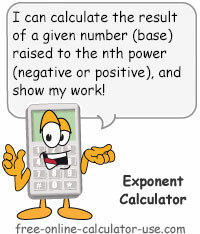 This calculator will calculate the answer of a base number raised to nth power, including exponential expressions having negative bases and/or exponents. Plus, the calculated results will include either an exponential multiplication chart (for positive exponents) or a decimal conversion chart (for negative exponents). Note that if you're ever looking to save some time when finding the square root of a number (2√x instead of x2), be sure to check out my Square Root Calculator. Enter either a positive or negative base integer. If the entered base has a negative sign in front of the integer, tap the appropriate option to indicate whether or not you want the base encased in a set of parenthesis. Enter either a positive or negative exponent integer. Click the "Calculate Power" button. This will find the base raised to the entered power and display a chart showing how the result was arrived at. Note that this calculator only handles results that are up to 15 numeric characters in length. An exponent is the small number located in the upper, right-hand position of an exponential expression (baseexponent), which indicates the power to which the base of the expression is raised. One thing to be aware of when working with exponential expressions that have negative signs next to their bases is that a negative sign that is not in parenthesis is different from a negative base that is enclosed by a parenthesis.